It was a short four day Chhattisgarh trip, so this time we had to plan a bit. Chhattisgarh has so much to offer. Some of the most dense forests in India, rich in flora and fauna, covering almost 40% of the state. Remains of ancient civilizations, many of them are yet to be excavated. And of course some of the finest waterfalls in India. We wanted to cover this much variety of Chhattisgarh in a four days trip. Quite a task in hand! Sayan made it at the last moment ... the train was about to leave Howrah. This time it was four of us, Me, Sayan, Amarjit and Indrajit Bose. Of course we were missing mama (Aparup), I believe soon he will be fit enough to join us. With 4 of us on-board, the Howrah- Porbandar Express left Howrah around 11 PM, leaving behind the busy city "Kolkata" towards Raipur, The capital of Chhattisgarh. The train was one hour late. Just outside the station, there was a giant screen, set by Chhattisgarh State Tourism Development Corporation. It was showing all the famous destinations in Chhattisgarh as well as the rich cultural inheritance of that state. That served as an introduction to the beauty of that place and made us more excited about the next few days of our stay there in Chhattisgarh. 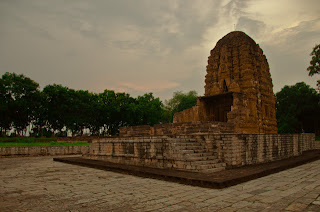 How to reach Sirpur, Chhattisgarh: Sirpur can be easily reached from Raipur (78 KM), the capital of Chhattisgarh. There are several buses available. Take a bus to Mahasamund and on the Raipur- Sambalpur road get down at KOHARI village. From there Sirpur is just 17 KM away. Or you can book a cab from Raipur, the rent will be 1500 INR approx. After reaching Raipur, our first priority was to get some food. The local marketplace is under "Marwari" influence. Almost all the hotels serve "Thali", similar to a "Rajasthani Thali" or "Gujarati Thali". The food quality was good and the rate was nominal. It took a while to decide our next action after we had our lunch. Our first destination was the "Medieval city of Chhattisgarh - Sirpur", known for the famous Laxman temple and other Buddhist/ Jain Stupas. To save some money, we took a bus towards Mahasamund from Raipur bus stand. That bus took us to the Kohari Dam stop. From there it was long waiting. Not many options available from Kohari to Sirpur other than bus and the frequency of bus service is low. Amarjit and Indrada were a bit confused, whether to go to Sirpur or to return back to Raipur. I was not. So again from Kohari we took the last bus to reach Sirpur around evening. 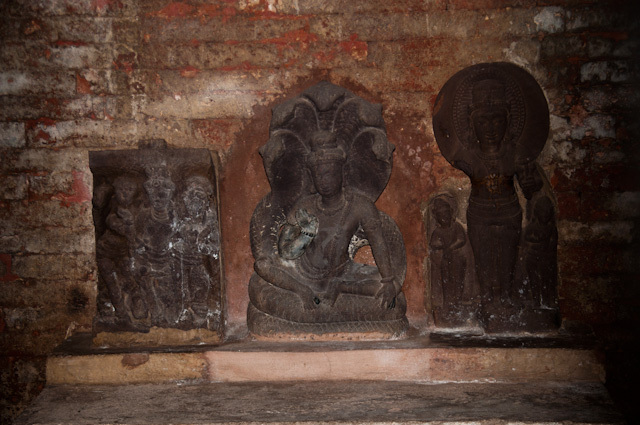 In the form of temples and stupas, Sirpur carries the assets of great medieval Indian artwork. 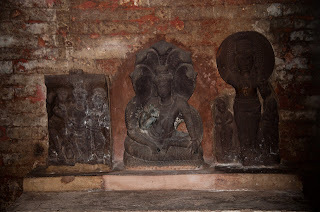 All of those worth a visit, but due to time constraint we directly went to the famous Laxman Temple of Sirpur. A Vishnu temple by nature, Laxman temple is a wonderful example of "Terra cotta" artwork. There is an adjacent Museum having great collection of sculptures and inscriptions of that time. Though I couldn't spare much time to have a good look. Soon it was dark. As we went there by the last bus, we were bound to find another mode of transport to return back. With help from caretakers of Laxman Temple, we found one Martui Omni. A local doctor owns that and the vehicle was available for hire. 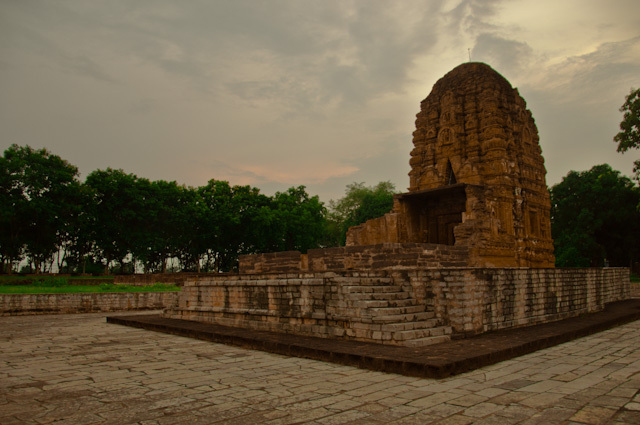 We booked it for our return and went to visit another famous temple of Sirpur – The Gandheshwar Temple. Situated on the banks of river Mahanadi, the famous temple of Gandheshwar (Siva Temple) looked really blessed. In the temple courtyard, there was a big and beautiful sculpture of Lord Buddha under a banyan tree, as if he is still meditating there. The vehicle we booked, picked us up from there and within half an hour we were in Kohari. We took a bus from there and reached Raipur around 10 PM. All of us were very hungry by that time. Near the Raipur bus stand, there is a very good restaurant - Rajgharana. We took "Rajgharana special thali" and the food quality was superb. We finished our dinner and came out of Rajghara to see a deluxe bus is leaving for Jagdalpur - our next destination. It was a sleeper class Volvo of Mahendra Travel's and I must say the journey was comfortable enough. Where to stay in Sirpur : The best available accommodation in Sirpur is the P.W.D rest house and for that an early booking is required. Other than that there are a few free "Dharamsalas" available. It was early morning, around 4:30 AM and we were already there in Jagdalpur. We tried a few hotels there, but luckily none of those really appealed to us and we got a better option later in that day. Chitrakoot Waterfalls, "The Niagara of India", is the biggest (Not the tallest) waterfall of India. I shoot this video of Chitrakoot during my trip to Chhattisgarh. Mesmerizing beauty! Awesome Trip. I think u enjoyed a lot by visiting Chhattisgarh. one of the well written posts i have read recently. Thanks for sharing . If u want to know more Tourist Places in India . Thanks :) ... your link is "nofollow"
Very well written and detaild. Can be handy for new visitors. We belong from raipur itself and i must say that this is the best blog from chhattisgarh i have ever seen..people are not so techy here but now i think revolution is coming..Kudos for your article and journey. Thank you so much ... I really have enjoyed that tour to Chhattisgarh. It is a hidden treasure in India's travel map. Good one. Thank for sharing your trip experience. Chhattisgarh is a very beautiful city. The capital city of Chattisgarh, Raipur is essentially a city surrounded by forest greenery. The Udanti Wildlife Sanctuary is located and is a place to spot the Wild Buffaloes, Panthers, Four-horned antelopes, Tigers and Chital amongst others. Check out 3 star hotels in Raipur also.